Lots of mums have been part of the many Positive Parenting groups we have run but not so many Dad’s have been able to join us! 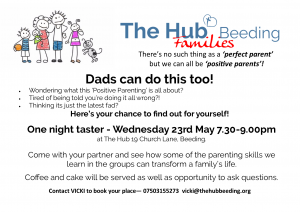 Here is your chance to come and find out a bit more about why Positive Parenting can be so effective in enhancing family relationships. Come along with your partner to find out what it is all about. ← Monday 14th May. Daily Devotional readings from the HUB.